Spend your vacation relaxing in our sunny cottage on a peaceful lagoon overlooking the first hole of the Harbor Course in Wild Dunes. You will love the convenient location of our home, situated on a quiet cul-de-sac in the Lake Village neighborhood just minutes from the main gate of the resort. The beautiful, uncrowded beach is only a 6 minute walk from the front door. The Grand Pavilion, and the Wild Dunes Village Plaza are only a short walk or bike ride away. 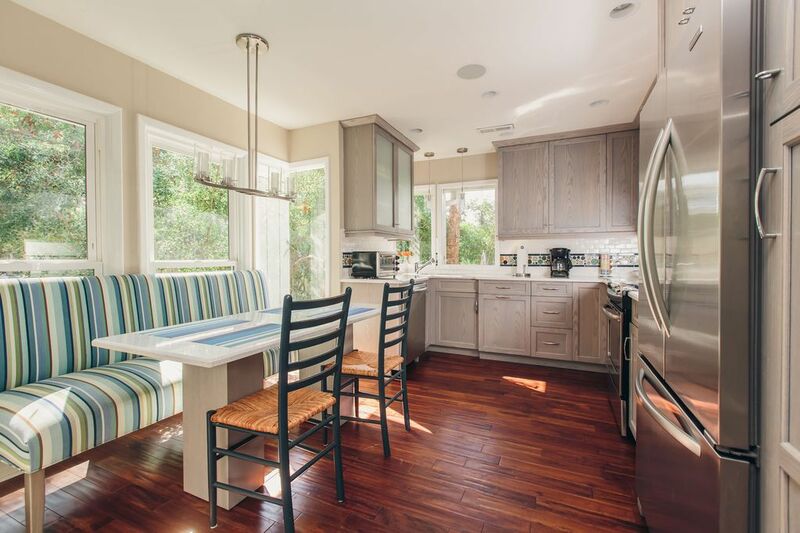 Decorated in a casual “beachy” style, this spacious cottage is perfect for your family or small group. The first floor includes a formal dining room, an eat-in kitchen, a comfortable living area with lagoon view, screen porch and expansive deck overlooking the lagoon and golf course. There are three bedrooms downstairs and one upstairs which will sleep a total of eight. The downstairs master bedroom suite has a new king bed (7/16) and attached full bath with dual sinks. There are also 2 bedrooms, one with a queen bed, the other with twin beds, downstairs that share a full bath. The upstairs includes another master suite which also has a pillow-top queen bed, a private balcony, and an attached private bath with shower. Plush bed and bath linens are provided in all bedrooms. Outside, watch the amazing sunsets from our expansive deck or take a nap in the hammock near the lagoon. The deck has plenty of seating for outdoor dining and entertaining. The cozy screen porch is perfect for enjoying that morning cup of coffee or for curling up with a novel on a lazy afternoon. For movie buffs and music lovers, our home includes a premium home theater system with surround sound and stereo speakers in the living areas and master suite downstairs. SONOS stereo speakers are located throughout the downstairs for you to stream your favorite music, as well as DirectTV and AppleTV on the main television. High speed wifi provided through Comcast. A Wild Dunes Sports Card is included with your rental, which gives you complimentary access to the swim center and fitness and tennis centers with a fee. Our home is only a 30 minute drive from Historic downtown Charleston with its carriage tours, upscale shops, fine restaurants and art galleries. Nearby Sullivan’s Island and Mount Pleasant also have numerous shopping and dining options. Boating, fishing, and water sports enthusiasts will find the Isle of Palms marina on the Intracoastal Waterway conveniently located as well. Both natives of Pennsylvania, we met here in Charleston and have lived here for over 25 years. We love spending time at the beach with family and friends and purchased our rental home in 1994. We think that the Lowcountry of South Carolina is truly one of the most beautiful spots on the East Coast. We are fortunate to live in a vibrant, thriving community with a great mix of restaurants, cultural activities, history and not to mention, incredible natural beauty. We think our property is unique because it is the only 4 bedroom rental in the Lake Village neighborhood and offers a very spacious floor plan and gorgeous waterfront views. If you are looking for a rental that is close to the center of the action, but with a quiet, neighborhood feel, we are your best bet. In addition, the beach access within walking distance takes you to a wonderful, uncrowded and peaceful beach...many times you will feel like you are on your own private beach. So if you are looking for a relaxing place to spend your vacation, look no further! All bathrooms include hairdryers, bath linens, tissue/paper and bath soap. Driveway can accommodate 4 cars. Updated with hardwood floors, custom cabinetry, quartz countertops, stainless steel appliances and eat-in table with bench seating and chairs. Separate dining area with bench seat and 4 chairs plus 2 additional chairs. Two golf courses in the Wild Dunes Resort. Owner provides Wild Dunes Sports Cards to guests with access to Wild Dunes Swim Center (approximately 5 minute walk). This home has an excellent floor plan and is well-maintained; the kitchen is fully equipped. The owner Lisa was very prompt in communications and in providing assistance. The only deficiency was the softness of the mattresses in the bedroom with twin beds. Overall, the home provided a very enjoyable setting for our family vacation. A beautiful house and setting. Very secure in a gated neighborhood. Plenty of room. Very nicely furnished. Wonderful location. Highly recommended. As advertised, great beach vacation! We were very impressed with the property and enjoyed our stay at the house. We were very lucky and caught a beautiful sunset our first night just as some storms cleared out. Conviently close to the beach, walk was very manageable. Access to pools were nice as well. Easy enough to get into Charleston. We were all very happy with this stay. Just wish we could have stayed longer. We had a wonderful time! House was perfect for our bachelorette weekend. Lots of room when we were all together and comfortable smaller areas for quiet times. Appreciate how well stocked the house was. View was amazing with nesting birds, turtles and an alligator to watch. Close to everything we had chosen to do. Would definitely come back to Charleston and rent here again. Thank you! We had a wonderful time at the Lagoon House in Wild Dunes. The accommodations were wonderful. The bedrooms were spacious and the living space provided lots of seating options. Thank you for providing the full size washer/dryer and soap. That really helped when it was time to check out. We loved the spacious deck overlooking the lagoon and golf course. We visited each morning with the nesting cranes in the trees, the alligators, and the turtles. Very peaceful. Only a short drive to the Boardwalk, pools, and beach. There was a slight musty smell in the house when we first arrived. We unfortunately were sitting on the deck when the landscape people came to blow it off, but we had already swept it clean when we arrived. Some of the women felt the outside could use a little updating with pressure washing and trimming of landscape. I know it must be hard to keep up with that in such a moist environment. Quite, comfortable, peaceful--- Yes I would stay in your home again. Approximately 30 minutes from Historic Downtown Charleston.